Every business has some sort of impact on the environment. Depending on the type of business, that impact can be pretty minimal or very significant; especially with the primary clients the Iowa Waste Reduction Center has worked with for over 30 years, businesses like manufacturers, auto body shops, dry cleaners, grain elevators, etc. With over 30 years of environmental consulting under our belts and thousands of visits to Iowa small businesses, our waste reduction and environmental specialists have become a wealth of knowledge in best practices, and some of the not so great practices that can lead to harmful implications to the environment and even fines from noncompliance with regulations. So I sat down with them and learned about the most common issues they have seen at facilities so you can make sure your facility passes the mark. The IWRC waste reduction and environmental specialists all agreed that incorrect recordkeeping is one of the most common compliance risks to businesses, whether it’s regarding waste streams, air quality permits, or even within the craft brewing process. Records must be kept organized and readily available at any time. Additionally, for many permits, records must be kept on-site and reviewed on an annual basis for the renewal of any applicable permits. These permits will include the renewal requirements and specifications regarding what information is necessary to include. When it comes to actually making records, go with what will be easiest. For example, if your facility is subject to the three-gallon permit by rule, you need to keep daily records of how much paint was sprayed. The easiest way to track that is a basic table on a clipboard that can be hung near the paint booth so the painters have easy access to keeping those records up to date. For many regulations, software programs have been developed which are especially helpful when needing to do calculations and keeping ongoing records. The IWRC has developed a couple free options for clients. Grain elevators can use GrainPTE to calculate PM potential to emit, comply with rule 567 IAC 22.10 and maintain records while Paint Tracker is a great tool for facilities to track and record paint and solvent usage. Manufacturing specialists at the IWRC have identified TCLP testing as a key risk because it is not widely understood throughout Iowa businesses and protects these businesses from any legal consequences. There are many examples of potentially hazardous wastes, including oily wastes, paint booth filters, or even sandblast media which if handled improperly, can end up in the landfill. Wastes that are potentially hazardous because of toxicity requiring a hazardous/non-hazardous determination through laboratory analysis using the Toxicity Characteristic Leaching Procedure (TCLP) testing protocol. Submitting a representative waste sample for TCLP analysis is the only accurate and defensible way to determine if a waste is hazardous or non-hazardous due to the characteristic of toxicity. The laboratory will determine how much of a waste sample must be collected to conduct the TCLP analysis. Samples should be taken with clean equipment and containers supplied by the laboratory selected to do the analyses. Waste deemed hazardous should be managed in accordance with the Hazardous Waste Management Regulations and disposed of through an EPA permitted hazardous waste management company. Any non-hazardous wastes may be landfilled or managed by a waste management company. As a response, specialists have developed resources to share more information including the characterization of samples as well as sample testing parameters. IWRC specialists indicated they frequently observe universal wastes ending up in the trash and sent on the way to the landfill. These items must be recycled properly through a recycling center as it is illegal to throw Universal Wastes in the trash. Through on-site audits for the Iowa Green Brewery Certification Program, specialists identified that fluorescent bulbs often end up in the trash, and now recommend that breweries utilize a recycling facility locator tool that locates their nearest recycling center and the types of waste they collect. Many of these centers collect all four categories of Universal Waste. 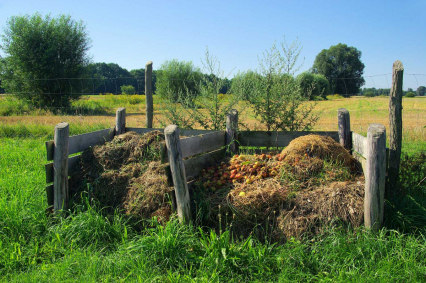 Composting is an excellent way to utilize general yard waste as well as divert food waste from the landfill; while at the same time creating a product that significantly lower landfill fees and may be useful in your operation. Through the IWRC’s work in K-12 schools and other institutions, it is becoming apparent that many these institutions are unaware of the potential cost savings that composting can provide, or they do not believe they have the staff to handle a composting project. Composting is one of the first recommendations that an IWRC specialist will share and the organization will be provided with a guide containing all necessary factors as well as helpful hints when composting. Anyone can do it with the right information. But there is one thing to keep in mind while composting: leachate. Leachate is a liquid created from rain falling on a compost pile and moving through the material within, collecting different chemicals along the way and then leaking out of the compost pile into the ground below. Within leachate are phytotoxins which can be harmful to plants and animals. Because of this, it is illegal for compost piles to be located near open water sources as leachate can leak into the water supply, reducing the oxygen content of the water, potentially harming or even killing wildlife. For more composting tips, the IWRC has developed a composting toolkit with helpful hints as well as best practices. While this article lists only four of the most common compliance risks, it is by no means a comprehensive one. Each and every organization is unique and has specific regulations that they must follow. If you have any questions or would like more information about anything mentioned above or regarding environmental regulations in general, feel free to contact us.